I thought you all might be interested to hear about what's going on in our Transitory Transitionary Transition Time. Also, there is a church near Charlotte (which would be my choice if location were our only criterion) that has asked Steve to come and meet with their Board/Pastor Search Committee tomorrow night. And that's especially good timing because he's already in Charlotte for his mom's surgery. So at least that's some progress in the right direction. I'll keep you posted if anything else happens. To make the weekend even more challenging, Steve and I haven't done a concert together in seven years, ever since Sarah was diagnosed. (We used to average 180 concerts a year for fifteen years!) We've done one or two songs here and there, but eight or nine songs in a row? Not so much. The plan is that I will just sing as long as my voice holds out (whether that ends up being half a song or half an hour) and then Steve will have to pull out every solo he's ever known to fill in the gaps. Just for the sake of a laugh, here's a picture of Steve and I doing a concert a looong time ago, when we did that sort of thing for a living. I was just a couple months pregnant with Sarah in this picture and at that point in the pregnancy, my hair was bigger than my stomach! I'll let you know how the weekend goes; I'm sure we'll have many memorable moments. While I'm on the subject of singing, I know I had said a few weeks ago that I would be going to Chapel Hill Medical Center once a week to begin some much needed vocal therapy. However, when we found out how much it would cost for the therapy (even after insurance paid some of it) we realized that this was not the ideal time to be spending that extra money. So that particular plan is on hold. 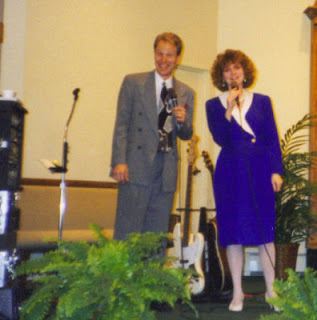 Singing and public speaking have always been such a big part of my life that not having a reliable voice has been an enormous and difficult adjustment. In fact, it seems like when I think of all the titles that describe me, most of them seem to be preceded by the word "former." Former singer, former speaker, former teacher, former songwriter, former recording artist, former pastor's wife, etc. Sitting here in the hallway of life, waiting for my "formers" to be turned into "currents" is a bit of a challenge. But the good thing about hallways is that they are not permanent places; they're meant to walked through. And I am more than ready to walk through this one--and soon! In the meantime, I will continue to do my melodious croaking and I will continue to write my blogs and eat my chocolate and love my family and learn new lessons in trust, and faith and patience. Just remember all your "currents". Current wife, mom to to great kids, blogger, writer, author, chief cook and bottle washer, etc., etc. If you think of those things maybe you will not miss your "formers" quite as much. I rarely correct you because you are so perfect in my eyes, but I must correct you now. You are NOT a former singer, former speaker, former pastor's wife, etc. You are still all those things. Gifts and talents don't disappear simply because we have stopped using them temporarily. I was a writer even when I stopped writing. The skill was still there. The gift was still inherent in that skill. I just wasn't using it. So, I guess I was a writer who wasn't writing. But I didn't stop being a writer. You haven't stopped being all those things either. You may not be using those gifts at the moment, but you still have them. And perhaps there are even more that will be revealed to you as you wait for the opportunity to use those gifts again. Perhaps they will be used in conjunction with the new gifts that are coming. Perhaps together those gifts will be even more amazing than you have ever considered or imagined. Perhaps God has read the desires of your heart and is working on fulfilling them to the next degree. Perhaps He is ready NOW and is using this time to prepare you. Perhaps this isn't about what you have lost but about what you will find. In you. In His time. Perhaps this space and time is part of that gift. Perhaps I will be able to say someday soon that "I knew you when...."
What terrific news! I will be praying that the most perfect job will come through very quickly!! PS-I just love Sue G!